Bob Scott, one of the very best All Black fullbacks, was born in Wellington and educated at Kapuni, Tangarakau and Ponsonby Schools. As a young man he played rugby league to senior standard for the Ponsonby club, then switched to rugby when he joined the Army in 1942. He played for the Motor Transport Pool team which won the Gallaher Shield that year. One of his team mates was another former league player, Johnny Simpson who was to go on to play alongside Scott for the 1945/6 "Kiwis", Ponsonby, Auckland and the All Blacks. Serving in Italy at the end of World War II Scott, after trials in Austria and England, was chosen for the 1945/6 NZEF "Kiwis" team that made a wonderfully successful tour of Britain, France, Germany and New Zealand. Scott had a fine tour, playing in 19 of the 38 matches and sharing the 'Tests' with another top fullback in Herb Cook. Back in New Zealand Scott linked up with the Ponsonby club and made his All Black debut in New Zealand's first post war Test series, against Australia in 1946. He played Australia again in 1947 when the All Blacks toured there. Scott had a top tour, with his goalkicking and general play being of the highest standard. In 1949 Scott was again the No.1 fullback when New Zealand toured South Africa. His general play was superb but, in a tight Test series, a series of narrow goalkicking misses proved costly. He played the 1950 series against the British Lions but was not available for the 1951 tour to Australia and announced his retirement from representative rugby at the end of that season. He did though play one game for Auckland in 1952 and was persuaded to make himself available for the 1953-4 All Black tour to Britain. Now aged 32 and sharing the goalkicking with Ron Jarden he played in the five Test matches with his general play still of the highest standard. 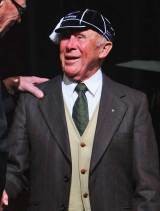 His career finished with club rugby for Petone in 1954 and appearances for invitation teams over the next few seasons. During festival types games he sometimes gave demonstrations of barefoot goalkicking, frequently landing goals from halfway. Initially employed as a warehouseman, then a painter and paperhanger and finally a men's outfitter in Petone Scott served on the Petone club committee 1966-70. Co-author with Terry McLean of "Bob Scott on Rugby" (1955) and "The Bob Scott Story" (1956) he also featured in an NZRFU coaching film in the 1970s. Standing 5'10 (1.78m) and weighing 12st. 7lb (79kg) Scott remains one of the finest players, in any position, to have played for New Zealand. Commentator Winston McCarthy wrote "For me there will never by anyone as great as Scott." Star South African No. 8 Hennie Muller described him as "Altogether, the greatest footballer I've ever played against in any position".